The simMachines Trademark Search Tool is a powerful new way to conduct complex searches of the USPTO trademark database. Traditional trademark search software require the systematic use of numerous queries in order to cover all possibly conflicting permutations of a trademark; by leveraging the simMachines Similarity Engine the Trademark Search Tool is able to search the entire USPTO database of more than 6 million trademarks for all permutations of the queried term in a single click, returning the most similar registered trademarks in a fraction of a second. This dramatically reduces the amount of time required to search for conflicting US trademarks and ensures that no permutation is overlooked. Please note that this tool is for demonstration purposes only and is not updated with recent filings. Powerful – Our trademark search software identifies not only trademarks directly matching the search term, but also similar trademarks, including those with transposed or visually similar characters. Accurate – Results aren’t just sorted by relevancy; metrics of how similar two marks are, and visualizations showing how the results are related to the search term are also provided. Fast – Other services require numerous queries to do what we can in a single click, and can take minutes to return results that we provide in under a second. Easy to Use – Our interface makes it simple to conduct searches that are difficult or impossible to conduct on other platforms. The Trademark Search Tool provides three ways to compare the search term to existing trademarks, each approaching the concept of similarity in a different way. All three methods first identify exact matches and then list other marks in order of their degree of similarity. As each search type looks for something different, it is recommended that all three types are used for any queried term. 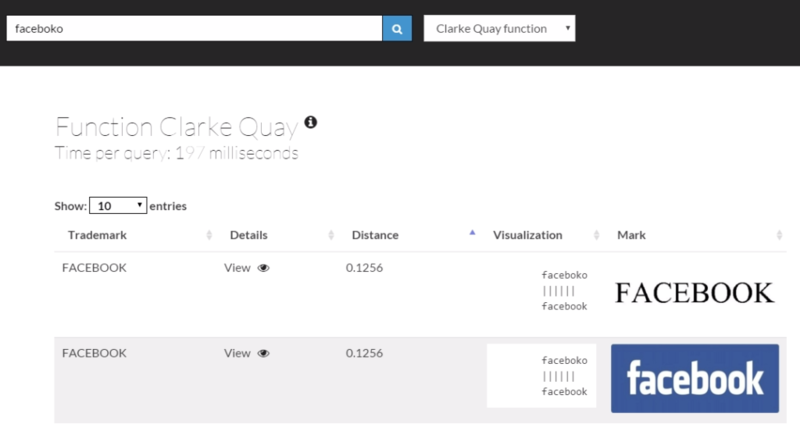 Clarke Quay – For finding a mark, in whole or in part, in marks of different lengths, and for identifying marks with visually similar characters. Levenshtein – For finding marks with similar spellings. Mset – For finding marks with transposed characters. Please visit the link mentioned at the bottom of the page to access the demo. You will be greeted to a page which requires a Search input of a Trademark followed by a selection of “Similarity Criteria”. Details of what each function means can be viewed in the Details page within the demo. In the example shown below, we have misspelled “Facebook” as “Faceboko”. However, our similarity engine is able to accurately search through the USPTO database and retrieve the correct trademark. (In this case, Facebook). Clicking on the “View” button results in a popup which describes the details of the Trademark and its associated details. Contact us to learn more about our trademark search software.